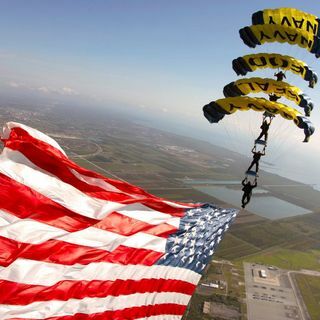 The Leapfrogs are the Navy's Parachute Team. This elite team of SEALs and SWCC have performed countless demonstrations around the country for millions of people. We sat down with one of the Leapfrogs to find out what it's like -- and what we found out surprised us. Intro: The United States Navy Parachute Team, or "The Leap Frogs," is the official parachute demonstration team for the US Navy. As a part of Naval Special Warfare Center, the team brings ... See More together active-duty Navy SEALs, SWCC, and support personnel. They demonstrate professional excellence by performing precision aerial maneuvers throughout the US. I'm Daniel Fletcher, today, we chat with Luke Vesci, a member of the Leap Frogs, who shares with us not only his personal perspective on parachute mastery, but also insights from his 13-year career with NSW. Let's get started. DF: Thank you so much for starters for sitting down with us. I appreciate you taking the time. LV: Absolutely, thanks for having us, yeah. DF: If you just want to briefly just identify a little bit of your career and your history with the Navy, we can start with that. LV: Okay. I've been in the Navy for 13 years and I came actually out of high school in San Diego. I joined the military, so it was very natural for me to join the Navy. I remember seeing all the helicopters flying by, and I'd actually come down and check out the training on the Strand when I was a kid cause I was really interested in that kind of thing (DF: Cool). Also grew up going to Miramar Air Show, and I remember seeing the jump teams at the air show and seeing the boats and, you know, the SEAL booth and the SWCC booth. I just remember thinking at a very early age that this was, this was exactly what I wanted to do. So, I joined the military back in 2005, and I decided at that time that I wanted to become a Navy SWCC, so what I did is I got a contract and joined the military, went to boot camp, did all the screening that was at Great Lakes at the time and went to SWCC school back in 2006 and graduated SWCC class 5-4, which happened to be the first class that we were actually awarded the SWCC designator, so SB. That was the first year SBs and SOs, SEALs, got their own designator, so that was, that was very privileged to graduate as a full blown SWCC at that time. From there, I checked into my first command, which was Special Boat Team 20, and that's in Little Creek, Virginia. I did three good years there, deployed twice. One of the deployments was an around the world tour (DF: Wow), so we went to the Middle East, we went all over the Philippines, Indonesia, so we did what we call the world tour, and it was a really great experience, especially for a first deployment. From there, I deployed again to Iraq, and I augmented one of the SEAL teams at that time, and basically what we were doing is doing a lot of over the land mobility with Humvees and then also doing some stuff on the water using some boats that we had basically built from the bottom up as a combat craft, so that was a really interesting deployment.